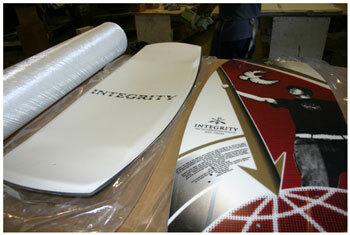 Erich Schmaltz of Integrity gave us an inside look of some 2005 Integrity wakeskates going through their rigorus production process. The images below were posted by Schmaltz on our message board. 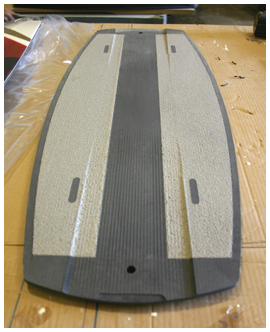 This is the first time we have had a board company post images of their production process and it just goes to show that Integrity has nothing to hide. Integrity takes pride in creating extememly durable wakeskates that will be able to withstand the punishment of riding them hard without losing that new skate feeling. In the first image, you can see the extra 22 oz patch of tri-ax glass that is used to make the skate extremely stiff. An additional 44 oz are added to the bottom layer. With both layers combined, these skates are almost impossible to break. The second image is shows the center-weighted CNC machined core. 75% of the weight is placed through the middle of the deck to help the board spin on axis on tricks like kickflips. The final image is a completed skate. 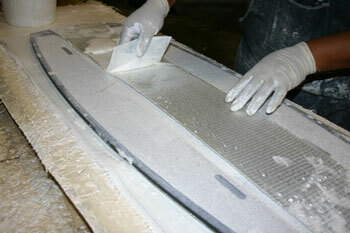 To see learn more about the Integiry production process, check out the Factory Photo Gallery on their website.